What is a Limited ‘LIFETIME GUARANTEE’? We stand behind our work so strongly that we are the only company in the industry with a true Limited LIFETIME GUARANTEE. Our GUARANTEE is a signed service contract stating that we not only get all of the animals out of your home or business now, but that for the lifetime of your home, we will keep them out from getting back in through entries that we have repaired. Our service contract also covers any repairs or replacements to areas of your home damaged by animals that have entered your home through entries that we have repaired for the life of your home! Why do I need a Limited LIFETIME GUARANTEE? Your home or business is oftentimes your biggest personal investment. Unexpected repair of animal damage can easily strain your budget, and finding an approved and insured contractor to solve your problem can be inconvenient, if not downright stressful. Our LIMITED LIFETIME GUARANTEE will give you peace of mind – and our annual reinspection helps to discover, prevent and/or mitigate any new animal access attempts while keeping your property secure. How does a Limited LIFETIME GUARANTEE work? While it is extremely rare, an animal may reenter your home through an entry that we have repaired. If this happens, simply request service by calling us and speak with a Critter Control customer service representative. After your service request is received, one of our Certified Wildlife Specialists will contact you to schedule a time to diagnose the situation. Once warranty repairs and any new covered animal damage repairs are complete, we will send you a followup customer satisfaction survey regarding the service performed via email. Why should I choose Critter Control’s Animal Exclusion Guarantee? The Critter Control franchise team leads the wildlife control industry with over 33 years of experience caring for our customers. We are committed to and solely focused on providing relief from home repair hassles caused by animal damage as we continue to deliver innovative home warranty products and services to our customers. How many times can I use my Limited LIFETIME GUARANTEE? You can use the guarantee an unlimited number of times during the life of your home. Is the Limited LIFETIME GUARANTEE transferable? This warranty is transferable to any subsequent owner of the property during the life of this warranty. In order for the transfer to be effective, Critter Control must receive a written notification (mail, email, fax, etc.) of transfer and any new owner must retain possession of our warranty contract. If buying a home what’s the benefit of being protected by our Limited LIFETIME GUARANTEE? A LIMITED LIFETIME GUARANTEE provides confidence during and after a home purchase. Unexpected and uncovered animal damage, removal, and repairs can be devastating to your budget. Enjoy your home without the hassles of worrying about animal intrusions through entries that we have already repaired. A home with a LIMITED LIFETIME GUARANTEE has been thoroughly inspected, and preventative measures have been taken at the points of entry, and other common access points to reduce chances and possibilities of animal entries. If selling a home why would I want a Limited LIFETIME GUARANTEE? A LIMITED LIFETIME GUARANTEE helps give buyers additional confidence in the real estate transaction – they’ll know that Critter Control stands behind the covered repairs and exclusionary devices installed on the house. An added benefit is that we offer a service to protect your home while it’s on the market, which can help you avoid investing more money into a home you’re trying to sell. 1. All materials, labor and service needed to repair any damage covered by our warranty. 2. Free consultation and advice concerning other pests/wildlife that may invade your home. 3. Additional inspections at any time during the warranty period if you suspect a wildlife problem. This warranty does not include repairing entries or areas of your home not repaired by us or not included on the original service agreement, Animal Entry Worksheet (AEW) and/or invoice, and does not include the cost of repairing or replacing computers, documents, artwork, or other personal property of any kind. The warranty also does not cover entries or other areas of your home that you have significantly renovated since the date of our repairs. This warranty also does not include coverage on temporary repairs or repairs that were recommended with a nonwarranty contingency or exception on the original service agreement. homes, multi-unit dwellings, and commercial property. Since your property is one of your biggest investments, it only makes sense to adequately protect it. How does the Limited LIFETIME GUARANTEE work? Step 1: Have the recommended service, trapping, or repairs done on your home. Your service will come with a signed limited lifetime warranty service contract from Critter Control. The package will provide you with your contract number and instructions on how to update your personal information. This ensures that you will receive the most current and accurate information from your local Critter Control representatives. What happens once a covered item breaks down? Step 2: Request service online or call 469.805.6267. Contact us by email or speak with a live representative. Upon receipt of your service request, we will have one of our Certified Wildlife Specialists contact you to schedule an appoint to assess the situation and schedule any necessary repairs or animal removal. How soon will someone get in contact with me? Step 3: You will receive an email/verbal confirmation with a Critter Control Technician usually within 24 hours during normal business hours to schedule a mutually convenient appointment. You will receive a confirmation that the request has been scheduled, and we will provide you with contact information for the technician. If the animal is in the living space and an emergency just let us know when you initially contact us as we will respond ASAP! What happens when the wildlife specialist visits my home? repairs, and all the trips necessary to complete the job. At this time, you will also receive a written estimate for the additional animal removal and any new damage repairs. Upon acceptance of the estimate for new animal removal and/or repairs, we will remove the offending animal(s) and perform the agreed upon repairs for the quoted price in the estimate. What happens after the wildlife specialist visits your home? Step 5: Let us know how satisfied you were with the customer service we strive to provide. Once the animal removal, repair and/or replacement is complete, we will follow up via email and/or phone with you to ensure your full satisfaction and that the service request has been achieved. Animal Entry Limited LIFETIME GUARANTEEs are a homeowner’s best defense against expensive animal entry and damage repairs. THE FINAL SOLUTION TO YOUR ANIMAL PROBLEM! We are a licensed franchisee of Critter Control®, the nation’s leading wildlife control firm, with over 33 years of experience ‘Protecting People, Property and Wildlife’®. With more than 120 offices in 38 states, our franchise is uniquely qualified to provide you with a superior customer service experience. 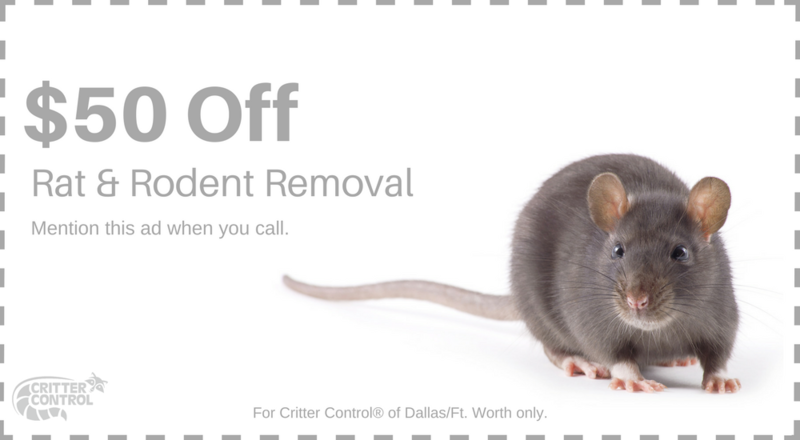 * Critter Control of Dallas/Ft Worth is an independently licensed franchisee/operator of Critter Control®, and the Limited LIFETIME WARRANTY above is offered solely by said franchisee. OR FOR ANY DIRECT DAMAGES OR COSTS EXCEPT TO THE EXTENT EXPRESSLY SET FORTH ABOVE. “Google Adwords: This cookie allows us to see information on user website activities including, but not limited to page views, source, and time spent on website. The information is depersonalized and is displayed as numbers, meaning it cannot be tracked back to individuals. This will help to protect your privacy. Using Google Adwords, we can see what content is popular on our website, and strive to give you more of the things you enjoy reading and watching.